Running was getting easier. To start with, it had been nothing but pain; acid in his muscles, aching in his shins and the abrasion of wind in a breathless throat. These were all the reasons Pat had hated running in high school. He used to wag physical education classes with some of the other boys, hiding behind the change rooms to smoke. Oddly, even though he’d almost drunk himself to death, he’d never smoked as an adult. It wasn’t because smoking was a health hazard; it was more that he didn’t like the taste. Once the adolescent taboo disappeared, so did his appreciation for tobacco. Strangely, running didn’t have much to do with his health now, either. That had been the reason he’d started after being discharged from hospital, but it wasn’t the reason he’d persisted. At one hundred kilos, Pat wasn’t cut out to be a runner. Too much weight to drag around; too hard on his hips and knees and shins and everything else. When he began, two kilometres was an unmanageable distance. He went all-out one day and couldn’t walk properly for the next two weeks. That and the fact he caught a cold, because of the rain. He soon discovered that the pain of running was a good thing. Most days, he had an amorphous, dissatisfied feeling. Life felt like it wasn’t just wrong; he felt as if he was wrong in it. He had a kind of curious certainty that whatever it was that tormented him was his fault. He believed it like a superstition; like a kind of faith and certainty about the world. 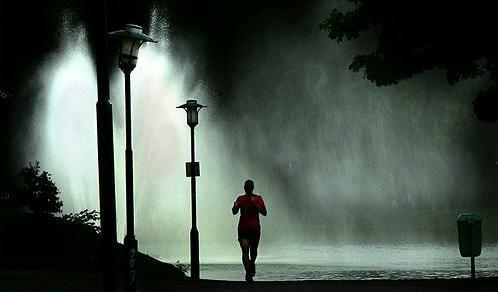 When he ran, he turned those vague feelings into pain and, for a time, sweated them out. He had a few regular routes in London. He tended to keep his runs to about thirty minutes, twice a week. Without a destination, he tended to run too far and get carried away, which meant injuries. Recently, the Achilles tendons in both ankles had begun to swell up. No reason; they had been fine for the first three months. It seemed that just as the pains in his hips were beginning to dissipate, other parts of his body had begun to fatigue and complain. Today he walked to the Botanical Gardens, a favourite running track of inner-city dwellers. It was twenty minutes out of the city on foot, straight down Swanston Street to where it became St Kilda Road; a tree and garden lined boulevard that wound towards the upper-crust suburbs. The Botanical Gardens course appealed to Pat as it was reasonably close to The Re:Public and had a loam surface, which meant that some of the the impact would be dissipated through the clay. He stretched his calves while leaning against a tree. The air had turned cold and from the bruising in the sky, rain seemed a certainty. Schizophrenic Melbourne weather. He turned and set off, determined that by the time the rain fell, it would sizzle on his skin. Pat had started at the top of a slope, which meant the first half of the four-kilometre run was downhill. This would provide easy momentum. The first kilometre was always the worst; the creaking and grinding in your joints before the influx of adrenalin and endorphin, before your stomach contracted down into a hard little ball. He always wore baggy clothes when he ran. Some people he ran with in England (a support group of another kind) ragged him about it. In fact, he was trying something new today; running in shorts. He had previously shuffled everywhere in a full tracksuit. At the conclusion of a run the tracksuit would be hanging off him, weighed down and sodden with sweat. The idea of baggy clothes was to conceal as much of his body as possible. All the drinking had made him ridiculously fat and he hadn’t given any thought to it. Until he got sober. The stress of being in the hospital had caused the weight to fall off him. His belly, while nothing compared to its original size, hung forward and down, and his pectorals were insulated by two blunt cones of fat. If he explored his girth and lower back with his fingers, they sunk inwards towards the softness of his internal organs. He felt as if getting sober and getting out of the hospital was a bit like waking up to find his twenty-year-old body had been interred in an older, uglier self. He turned the corner and started up the bitumen of the Anderson Street hill, the wind driving the rain into his face like a thousand tiny punches. He wasn’t running away anymore. He was running towards something; a thing that can’t be bought, sold, swallowed, smoked or injected. He wanted penance. He wanted punishment. There was no reason why it should feel good. But, like his other, conflicting certainty, it just did. This entry was posted on February 28, 2015 at 5:17 am and is filed under Theme Parks and Obstacle Courses with tags achilles tendon, alcoholic, Botanical Gardens, fat, Melbourne, running, St Kilda Road. You can follow any responses to this entry through the RSS 2.0 feed. You can leave a response, or trackback from your own site.